Acupuncture is a well known form of Chinese medicine where very fine needles are inserted into specific points around the body to reduce pain and treat disease. Even in the West, many people now have acupuncture routinely for a whole variety of conditions from pain relief to giving up smoking. 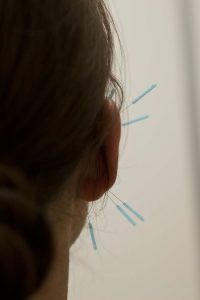 What is less well known is a specific form of acupuncture that focuses on using only points in the ear. Called Auricular Acupuncture one particular form of this is both simple to learn and easy to apply. Usually referred to as the NADA protocol, needling just five points in the ear has been shown to deliver huge benefits for a number of conditions. So, what exactly is this NADA model and what conditions has it been shown to help with so much efficacy? NADA stands for National Acupuncture Detoxification Association and, as the name implies, this was originally developed as a way to help recovering addicts to kick their drug habit. The technique was initially developed in 1972 from the work of a Hong Kong neurosurgeon, H.L. Wen, who discovered that acupuncture could help alleviate the symptoms of opiate withdrawal. From there, acupuncture detoxification was introduced at the Lincoln Hospital in the South Bronx area of New York City in 1974. By the mid-1980’s, the success of this unique procedure had become so clear that treatment facilities across the United States began incorporating acupuncture into their substance abuse programmes. Evidence from these early days built and it soon became evident that the same protocol that was used to help people detoxify had several other benefits too. Notable amongst these was the positive effect it had on a patient’s mental well being. In addition to the reduced cravings for alcohol or drugs the protocol seemed to greatly reduce levels of stress and anxiety in the patient, which in turn lead to increased calmness and better sleep patterns. From there, the same protocol has been used effectively in a variety of situations where some emotional trauma is present. From disaster relief to people with serious psychiatric illness, cancer and HIV, the NADA protocol contributes greatly to a reducing levels of stress and trauma. What is the NADA protocol? The actual treatment sessions involve the placement of small sterile disposable needles into specific sites on each ear. 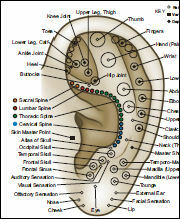 The NADA ear acupuncture protocol uses the shen men, sympathetic, kidney, liver, and lung acupuncture points. Once the needles are inserted, the recipient sits quietly for between 30-45 minutes. In the development of the NADA model it was found that effective treatments could be delivered without practitioners having to diagnose the specific causes of their patient’s condition. It was therefore unnecessary to attend a medical school for years in order to learn the full system of acupuncture. The complete NADA protocol can be easily taught over a weekend course. This makes it an extremely cost effective training technique considering the multiple benefits that the treatment delivers. From its early beginnings in the States, the NADA protocol has expanded worldwide and is used as an additional treatment in thousands of healing situations. It is estimated that there are now well over 25,000 providers worldwide who have been trained in the NADA procedure. In Denmark, the protocol is one of the most widely used forms of complementary practice used in drug rehabilitation programmes. Likewise, in Sweden the NADA protocol is widely used in psychiatric treatment. Additionally, some 130 prisons across Europe offer the NADA protocol for inmates, with treatments provided by trained prison staff. The NADA ear acupuncture protocol is clearly a multi purpose therapy which is clinically effective, cost-efficient, drug-free and universally acceptable. The protocol has increasingly been understood as a stress reduction and calming technique which benefits many different conditions; it is this fact that perhaps lies at the root of its success, giving the body the space it needs to initiate its own healing. If you would like to learn the NADA protocol for auricular acupuncture then you may be interested in our forthcoming course on 8-9th April 2017. 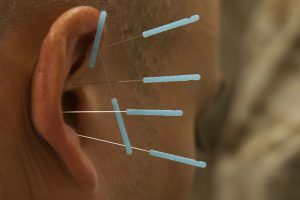 Held in Staines, West London this course is the perfect introduction for people looking to share the benefits of acupuncture with their clients, schools, peers, family or friends. Remember, no previous training is required to learn the NADA protocol so, if you would like to learn how to harmonise mind and body with acupuncture, then please email me at info@universalenergyhealing.net. Please stay in touch. You can also sign up to our monthly newsletter ‘Confessions of a Misguided Monk‘ for details of all our trainings. Feel free to share a comment or questions and I will get back to you. Click here to read The Big Idea – it may help you to understand more about our healing philosophy.